Doug Van Pelt checked out Californian metal team RECON. "Recon, an elite force, highly trained for war; armed and dangerous, the enemy is no match for a warrior of God. Come and join the soldiers of the light. Be prepared to tread dangerous ground, and to fight behind enemy lines." The self-penned description from the title track of the band's debut album spiritually explains what these artists have done with their music. "I'm not ashamed to say," says guitarist/founder George Ochoa (who also plays lead guitar for Deliverance) "I was watching 'Heartbreak Ridge' with Clint Eastwood...there was a recon unit there. It sounded really cool, and I dug the spiritual parallel. They were sent in behind enemy lines. Outside of Navy Seals, the recon unit is probably the highest-trained outfit. Spiritually, the recon went behind the enemy lines, like the clubs and all these places, into the devil's territory to preach the Gospel to set the captives free. It takes a warrior to do that; not a wimp with a gun and no bullets in it. He's gotta be fully prepared." 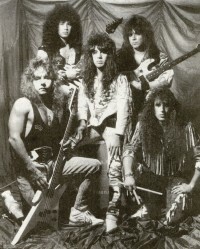 The beginnings of the band Recon go back to the band DeRoque. "I left my last band," says George, "because they were really wimping out. I knew John and Vett were available as musicians. They were totally into it. I knew Eddie from Sanctuary Whittier. The initial thing was I told these guys, 'We're gonna stay heavy, and be more progressive.' They've kept their motto on their debut album, which rides a progressive wave over the heavy, crunchin' rhythms in each song. Since the recording, there's been some personnel changes. "Eddie, the rhythm guitarist, became too busy," says Mike. "He's been replaced by Eric Mendez, who used to play with Royal Priesthood." "Eddie just got married," says George. "In the Old Testament, a fighter in the Israeli army, for the first year of his marriage, wasn't allowed to go out in the battlefield. I look at it as Eddie's chilling out being married." "He's having a baby in August," adds Mike. "He didn't have time to practice." The former lead vocalist, Vett Roberts, was asked to leave "because we got real uncomfortable about his walk," explains Mike. "God was not going to bless the band. Like they say, 'you can bring a horse to water, but you can't make him drink.' He said he wanted to live the life, but we just couldn't get him to do it. We spent a lot of time reading the Bible to him and praying with him. I said, 'Call me collect, Vett, anytime." "One cool aspect of Vett," says George, "is he's a good guy to talk to. He's got a massive zeal to spread God's Word, but just day-to-day, living out your Christian convictions and what the Lord has commanded us to be like - that's been a problem. "We're not self-righteous or think we're any better than anybody, but it takes somebody that's serious. We want to be blameless as a band." "It's gonna bring the level down if someone's not right with the Lord," adds Mike. "We talked to Vett a lot about his lifestyle. We constantly talked to him about getting together with us and doing things with us, and to kinda quit hanging around non-Christians." So, the band begins a search for a lead vocalist. Meanwhile, guitarist George Ochaoa is going to fill double duty with Deliverance and this band - as long as Deliverance's schedule doesn't go gangbusters. Originally, Recon was to be no more once the album was finished. "But," explains George, "doing the album kinda united it back and sparked off the vision again. It's a cool album, and there's really no reason why it shouldn't continue." If George's schedule wasn't busy enough, he's also a husband, associate pastor of Sanctuary Hollywood, and a construction materials salesmen. But, the big question is: Did he purposefully rip off the Queensryche sound? (Laughter) "Here's my answer to that question: Influences obviously come through. Once a musician has an influence...And I don't care who you are, a musician has an influence. You heard somebody play and you said, 'I like that. I wanna play like that one day.' To me, we haven't ripped off Queensryche, but what I like about Queensryche that I would even come close to applying to Recon is a thinking man's metal. It's not bone-head metal progressions. It would be something that would have more thought put into it. Something that's got a lot of texture and feeling and mystique to it. There's this new movement going on, where everybody's wanting to play this blues, party-type metal, and it's the easiest stuff in the world to write. It's workin' I guess right now, but for me it would never come close to satisfying me musically. It might make you some money, but it sure wouldn't satisfy my musical drive." "If you have any friends that are into this style of music, turn 'em on to it. I believe it is right up to par with what's going on out there, I really do. Use Christian bands as a tool to glorify the Lord with and to spread His Gospel. By all means, it shouldn't just be something you put in your tape deck and have a good time to. There's nothing wrong with that. I believe a Christian needs to be entertained. He needs to have an alternative to music that's not good for him. At the same time, I get letters all the time from people who tell me that they use the tape for ministry. "And they go, 'Really? What do I have to do to get saved?' Things like that happen all the time. When I hear that happening, I think, 'That's really what it's all about.' That's one thing we hope that would never cease with Recon. If we start writing about 'The flame,' or 'The Light'...and, you know, getting afraid to use the 'J-word', you're not gonna get those calls. You're not gonna get kids saying, 'I wanna know about Jesus.' It's just not gonna happen, because Jesus was direct. Not just Jesus, but the Apostles, all the church fathers, the reformers, and all the preachers we have today...I mean we have no time to waste, especially in these last days. "I've heard a band have lyrics like, 'Find your way to love.' They're so afraid to use the 'J-word', you know, Jesus, that they say, 'You guys have gotta find your way to love, and if you need any help, we'll help you after.' To a guy that's got a few beers in him and sees this blonde on the other side of the club, that's his way to love. If I heard that from the stage and I was a heathen, I'd say, 'That's cool. That's love over there,' and I'd go find that blonde chick, whatever. "So anyway, use Recon as a witness tool." There you have it, folks...and from a band that's not afraid to use the "J-word." Doug Van Pelt is the editor of HM Magazine in Texas.